A long time ago, in what seems to be a galaxy far away, hip-hop had no name and street art had no place in books. B-Boys, DJs, MCs and graffiti bombers united to create hip-hop, and were immortalised in the genre’s cinema testaments ‘Wild Style’ and ‘Style Wars’. One of these characters was a strange mythical figure who for over 15 years built The Battle Station, hoarding odd objects, illuminating language and spewing culture premonitions from the hollow bowels of shamanic sci-fi robots. His code name was Rammellzee and The Battle Station, his lair, loft and workspace – something like a benign Death Star, if it were populated by medieval monks (graffiti’s forefathers according to his theories) and racing letters storm-trooping through brightly scribed hallways, ready for the galactic battle of words. Dazed Digital: Rammellzee has such a compelling story. Could you tell us a bit more about him, his Battle Station and 'the equation'? Suzanne Geiss: There is not a singular way to think about Rammellzee. He is an enigmatic figure to say the least. He was born in Far Rockaway, Queens in 1960. He started writing on the A train in 1974. Besides being an artist and graffitist, he was a theoretician. He projected a fantastical world through grammar, creating unique combinations of letters he deemed equations. 'The equation' and the Battle Station were part of a symbolic war for a complex cultural identity, one that rests somewhere between art and life and where graffiti, hip-hop, linguistics, and fiction fuse together. DD: What inspired to curate this expo? Suzanne Geiss: Since Rammellzee's death last year, it has become important to establish Rammellzee's reputation within the canons of art history, as well as to show his influence on a younger generation of artist. DD: What are the ideas behind the 'Iconoclast Panzerism' and 'Gothic Futurism' manifestos, which links graffiti writers and medieval monks? Suzanne Geiss: The ideas behind Rammellzee's dual-theories come from an imagined world in which Roman letters liberate themselves from power structures embedded in language. For Rammellzee letters were not just meant to be look at or read, but were three-dimensional and habitable. His work encompassed a similar belief in 'total-art' like past artists such as Duchamp, Breton, or Marinetti, but for Rammellzee the whole culture of the past became an archeology for him to re-build language from. The link between graffiti writers and medieval monks is through the power that comes from the manipulation of discourse to create a desired cultural reality. In medieval times the clergy were able to dominate society through their literacy, conversely in the modern world graffiti artist are empowered through their subversion of language, so that the establishment no longer recognises it. DD: Rammellzee once said that "we have failed what could have been 'Our' culture..." - why was that? Do you agree that hip-hop culture lost it soul when it became business and moved away from the trains? Suzanne Geiss: I think what Rammellzee might have been referring to is the ability to create and shape a world for ourselves rather than have one narrated to us by those in power. Rammelllzee lived in such a way, where the hierarchies of the "real world" have little significance. Rammellzee would have certainly thought that hip-hop culture died once it turned into a business and moved away from the trains. He shut himself away from the world of money and power by being a recluse in his Battle Station. DD: What are the Letter Racers? And what are some of the weirdest things they were constructed from? 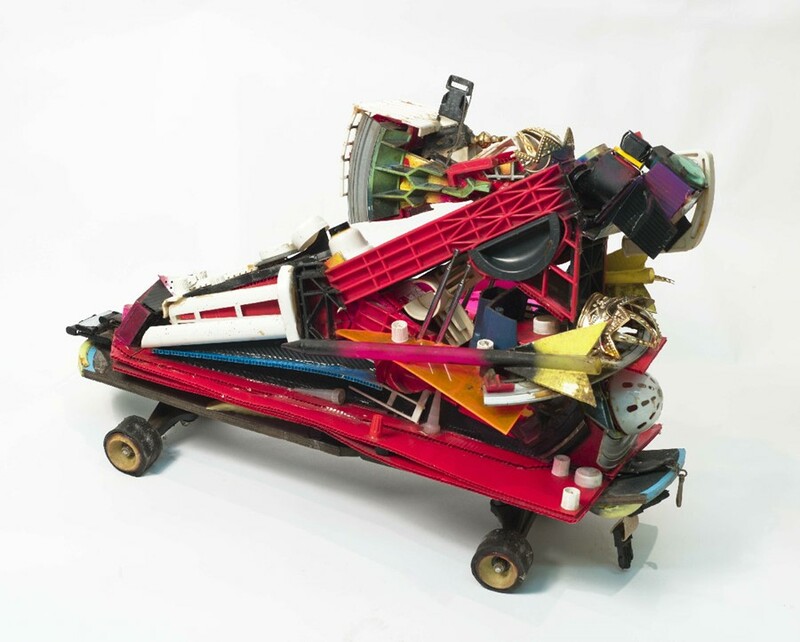 Suzanne Geiss: The letter racers are spacecraft like sculptures, representing the letters A to Z, made of found objects, spray-paint, Plexiglas, and corrugated foam core on customized skateboards. Some of the weirdest things they were constructed from include, his wife's birth control pill packs, Golden's mustard caps, umbrella handles, and Old English 800 bottle caps. DD: How big was the impact of his 'Gangsta Duck' and why is 'Beat Pop' a hip hop touchstone? Suzanne Geiss: Rammellzee played an important role in hip-hop's early phases and often performed and recorded as an MC. He participated in early hip-hop sound system battles, where he developed 'Gangsta Duck' a nasally rap style that went on to influence the sounds of The Beastie Boys and Cyprus Hill, among others. 'Beat Bop', produced by Jean-Michel Basquiat (who also designed the cover) is a touchstone because of the dense dialogue or role-play between Rammellzee as a pimp and K-Rob as a schoolboy. The lyrics were a result of in the moment improv - all of Rammellzee's songs were. "Beat Bop" is the most sustained example of Rammellzee's wordplay, fantasy, and unique rap style. DD: Which other three Rammellzee tracks do we need to listen to? Suzanne Geiss: "No Guts No Galaxy," "When Hell Freezes Over," and "New Meaning". DD: It's the first time the Letter Racers are being show in NY - why now? How will Rammellzee's legacy live on in the future, and continue to wonder and confuse? Suzanne Geiss: There is interest from a younger generation in the dynamic scene that grew out of New York in the late 70s and 80s that Rammellzee was a part of, yet not usually credited with. The ingenuity of Rammellzee's world speaks to the zeitgeist of today which is so much about self-invention. His legacy will continue to captivate because he was successful at integrating his life and beliefs, persuading those around him to participate in his constructed world. 'RAMMELLZEE: THE EQUATION, The Letter Racers' - From the 8th of March to the 21st of April 2012 at Suzanne Geiss Company.